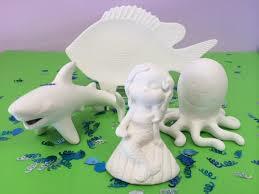 Bring your little ones to paint their own ocean inspired ceramic figurine to take home. As the figurines are drying, the little artists will learn all about the magical world of sea turtles through open discussion and hands on artifacts. This activity is for the age range of three to five years old children. The cost per person is eight dollars each for the ceramic figurine painting. You can attend this event January 14th, January 21, and January 28th. This events will be held from 10:30 AM- 11:30 AM. This event is at Loggerhead Marinelife Center 14200 US Highway One Juno Beach, Florida. Loggerhead Marinelife Center is dedicated to ocean conservation efforts specifically through educational events and research efforts of Loggerhead Marinelife Center staff and volunteers. We can not do this alone - we need your help to speak on behalf of the endangered sea turtles and other marine life found in our coastal waters. The health of our oceans and beaches is not only vital to our marine friends, but to the South Florida economy. Billions of dollars are spent annually on marine industries including fishing, boating and recreation. Do your part; learn why education and research involving the beaches and marine ecosystems is so vital to South Florida and how you can help advocate for a cleaner, safer ocean for years to come.